Ambode submits nomination form despite plot to stop him – Royal Times of Nigeria. The Lagos state governor, Akinwunmi Ambode, has submitted his governorship nomination form at the headquarters of the All Progressives Congress (APC) in Abuja today. 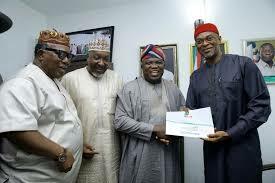 He submitted the form 48 hours after he alongside two prominent APC chieftains in Lagos Obafemi Hamzat and Jide Sanwo-Olu, picked up governorship forms at the APC secretariat. Sanwo-Olu is believed to have the backing of Bola Tinubu, the estranged godfather of the governor. While submitting his nomination form today, Sanwo-Olu, said he is in the race to bring his wealth of experience in both the private and the public sectors to bear in improving the lot of the people of Lagos. The aspirant said he is prepared to do what was necessary to improve the living conditions of all Lagosians. Report gathered that there is a threat to impeach Ambode if he does not drop his second term bid. Both Ambode and Tinubu have been silent on the reports of the rift between them.